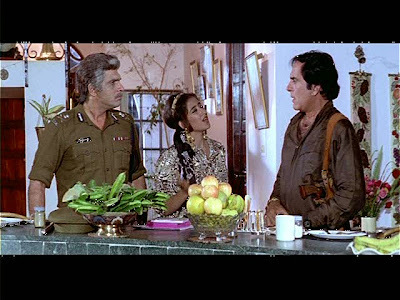 Yalgaar is not so much bad as it is lacking in any enticements - unless you like early Sanjay Dutt, and I know some people do, especially shirtless and/or bemulleted. I was bored and unmoved. It drags. There's too much time spent on uninteresting things. And sometimes they just ramble on and on for no apparent reason. 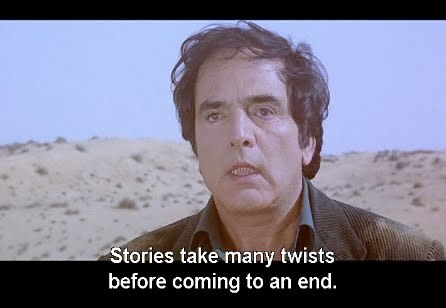 Feroz must be talking about some other film here - any "twists" Yalgaar may claim are predictable and not handled with any kind of sharpness or surprise. 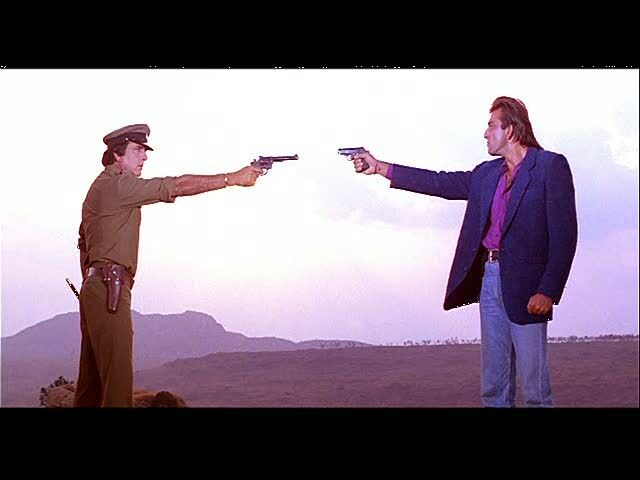 and his by-the-book cop father Mahendra (Mukesh Khanna) on one patriotic side and crime boss Raj Singhal (Kabir Bedi) and his dumb but thuggish son Vishal (Sanjay Dutt) on the selfish and corrupt other. 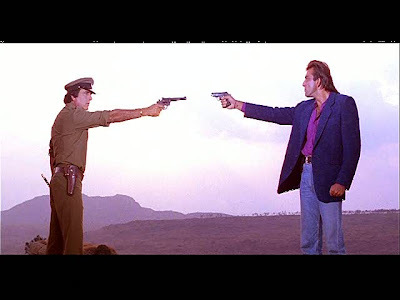 I could wail over the ill-fated yet Maa-sanctioned love of Meghna (Manisha Koirala), daughter of Rajesh's cop brother who was killed in the line of duty, and Vicky (Vicky Arora), upright family-business-spurning younger son of Singhal. I could even retain a glimmer of hope for the budding romance of Rajesh and the Sunita (Deepti Naval), the widow of his partner. 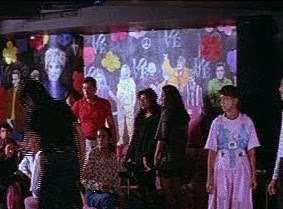 But there's not much more to work with than what I just told you, and it's more fun to enjoy the bad 90s fashions and set design, so let's do that instead. I've said it before but I'll say it again: the 90s were kind to no one. "Why are Neena Gupta and I in this movie?" The dancing in this movie is dreadful. Aerobics-style lurching and 90s side-by-side silliness abound. 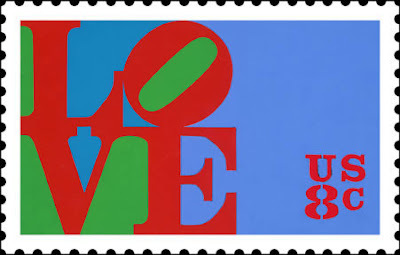 Aside: some of this awful dancing occurs in a night club that has Warhol and Robert Indiana art in it (note the mural with Indiana's LOVE motif), as well as walls full of musical instruments. The crowd here is sympathetic, to put it mildly, and are somehow so moved by the music that they hold up lighters. Did we teleport to a Styx concert without my noticing? I really wish we had teleported to a Styx concert. Vicky Arora makes this same basic facial expression throughout most of the film. IMDB says he's done only one other movie, and it's no mystery why. Singhal is a bad guy. You can tell by of his giant bubble bath. He also has Dogs Playing Pool in his rec room. People in this movie like bowls of fruit. 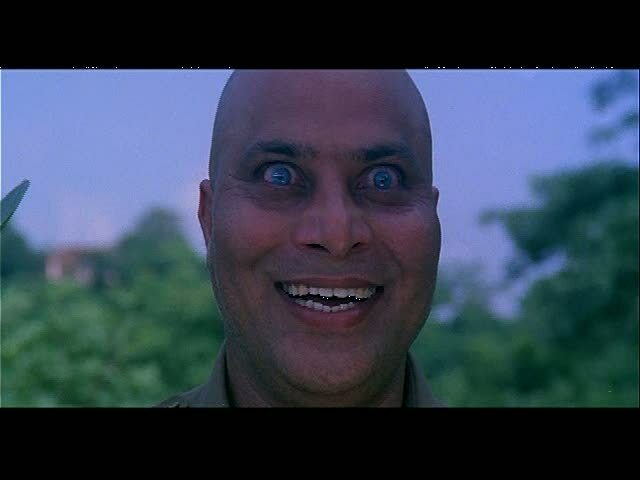 Is this Manjeet Kullar? 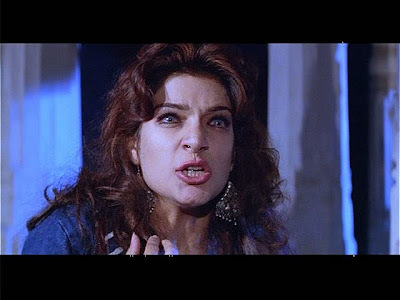 Whoever she is, does she remind you of Jan Hooks as a Sweeney Sister? And who is this? Scary! Vishal may be a criminal, but it seems like he has a hint of a proper Hindustani dil, doesn't it? Maybe not. There are other gull-wing cars out there. 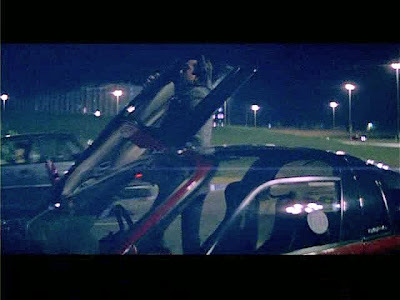 But it's more fun to think of Sanjay Dutt with a DeLorean, so that's what I'll do. For a more involved look at Yalgaar, see this post by Diwali, Queen of All Things Sanjay. I disagree with her on almost every point (except her shared dislike of Vicky Arora), but hey, that's what makes life more interesting. As for me, I need a palette cleanser pronto. Fortunately, Sawaal just arrived in the mail, and I have cleared my schedule accordingly. Shashi to the rescue? Pleeeeeeease? 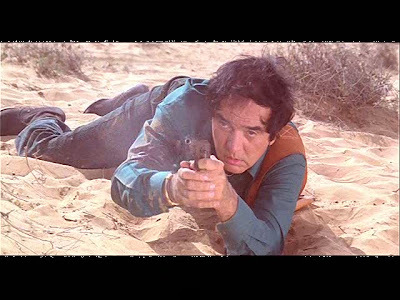 I posit that the film would be quite glorious with about 40 minutes cut, half the actors replaced by people who can act and more of Feroz' proto John Woo moments. As it stands, and as you know, we are for once in complete agreement about a film. When I saw the title, I thought this was the 80s film starring Kamal Hassan and Poonam Dillion, then I remembered there was a 90s movie with the same name. Manisha was so beautiful. 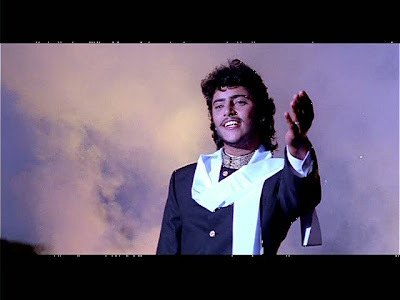 And I found Sanjay Dutt hot in a dorky, mulleted way. Actually, I still think he's hot, but now in a FILF way. Well, I actually do like Yalgaar, and I stand by it. Though I accept your views (not just the one about Vicky Arora), of course. I also do honestly doubt that I'd have liked the film as much had it been made without Sanju. Who else, for one, could have played Vishal's dialogue with his unborn son as sweet and touching as him? I was wiser in the 90s. I stayed away from most Hindi films. Guess I missed a lot of fashion fun, though. 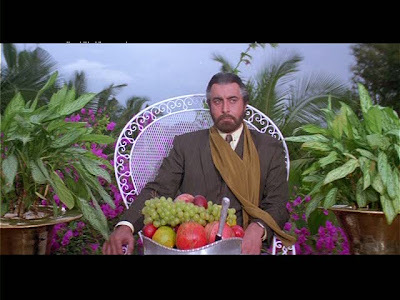 Isn't Kabir Bedi cool in the bubble bath, and his wife actually sitting near him. Wow! That is his wife, right? Because a babe-type would be in the bath with him. LOL! At least these films make for fun reviewing. I adore Sanjay myself, but he has made some really really really *BAD* movies. house - The film did suffer from too little Feroz (and Deepti and Neena, or "the widows" as you like to call them, which is indeed their major character trait), despite too much of everything else. lapetitediva - Oh sadly no. I bet that one is better, and in fact I should go in search of its songs right now. Your second paragraph made me LOL. I much prefer Sanjay now. I didn't think he was horrible in this film, but his general look and way of acting are not my cup of tea. Diwali - Of course you are!!!! I have been thinking over your question about who else could have played Vishal to the same effect, and I am so ignorant of films circa 1985-95 that I honestly have no idea. Banno - That is my attitude as well. Fortunately youtube can help us with fashions and side-by-side dancing without requiring whole films. Kabir Bedi is VERY cool in his bubble bath. I do believe this is how he is introduced in the film, and I was chortling away at the idea of the bad guy in a bubble bath. And yes, that is his wife, serving him a cup of tea in the bath - your theory of women and their positions vis-à-vis bathing is totally sound. I had hoped for chippies too but sadly he is a family man through and through. You are the first person I've met to admit to adoring Sanjay who is not a native speaker of either Hindi or German! Ellie - That's about how I felt about it too. He is introduced with a long and very sweaty workout sequence (in which his wife sits and watches quite keenly, which I found hilarious but was glad for re: women expressing self-determined sexuality etc etc), and I was done well before that was over, but then we get more of it in the sad sad song linked above. I am weak on Madhuri movies (because of previously mentioned aversion to 1985-95) but agree that it must be something really sterling in her herself that let her out of that era alive. I watched about 20 of her songs on a song DVD this summer and can totally get why people love her, but I think song DVD is the way to go, because you're likely to be getting the most consistently good aspects of her films. But even then, you have to see drunk Rishi failing to keep up with her, and that's really sad. The side-by-side 90s dancing is always good for a few laughs. I should a video of it!!!!! I'm sorry. The title I'm thinking of is Yaadgaar. I got confused because the titles are kind of similar. Well, I have three words for you: Khoon.Bhari.Maang. The 80s were even unkinder than the 90s. It trumps Yalgaar, and I have screen caps to prove it. PS My ancestry is part German, maybe that's it? "The film did suffer from too little Feroz" - really?! 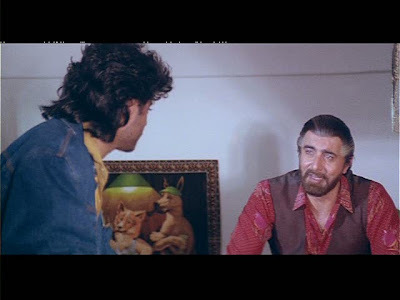 I thought it suffered from too much of everybody but Kabir Bedi. I could definitely have done with more of him (and Deepti and Neena, too)! :-D Now when I think back on it - HOW did I happily sit through the whole film?! Short answer - it was 92 and there were no other choices! Ajnabi - you say that, but did you watch the video? Sanjay really needs to be seen in motion. You've got Vicky Arora down to a t. He was just mild all around - there's hardly anything else that could be said about him. Blaaaaaaand. FG - Side-by-side dancing video? YES PLZ! AHA! This ancestry thing must be investigated. bollyviewer - Ha! Basically this movie needed more attention to the older generation and less to the younger. 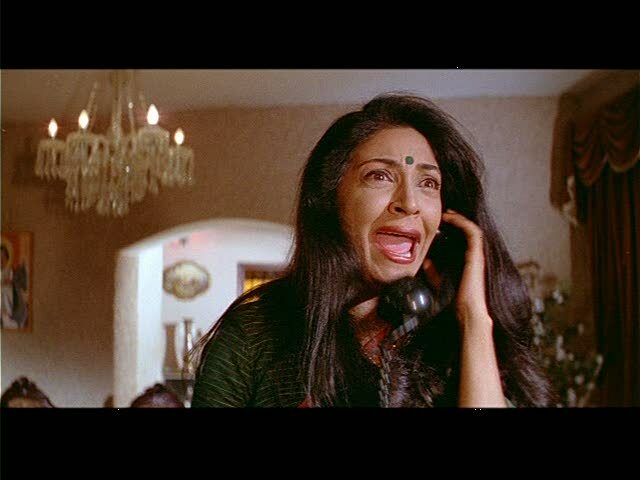 I know there are lots of Manisha fans out there, but god she was annoying. I'm not sure it's her fault, really, but yech. LOL @ "To be fair, Sanjay's moves are more a kind of combo of working out and stress/rage-release than they are actual dancing." 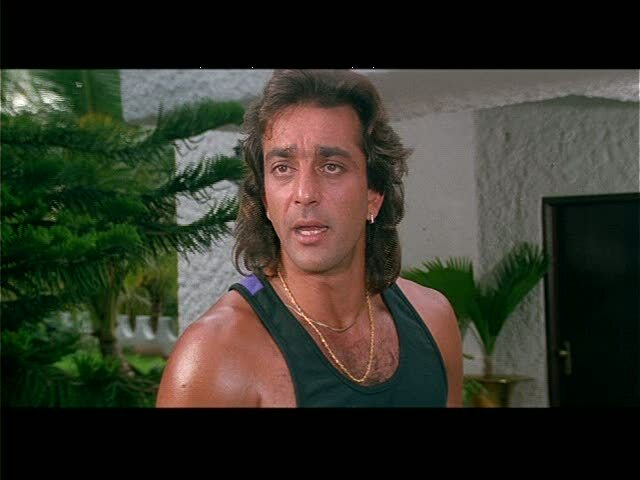 And more LOL @ what lapetitediva wrote here, "I found Sanjay Dutt hot in a dorky, mulleted way." Wow. That title card you show up top is like a five-alarm fug alert all on its own. Anyone who ventures any further into this movie beyond that point has only themselves to blame! 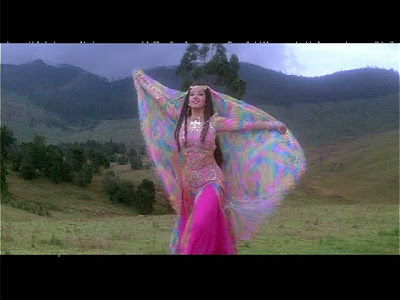 I am grateful to Bollywood for teaching me that India is a land of over a billion people, each of whom bursts into spontaneous song and dance every 20 minutes for no apparent reason! This is a wonderful custom that in my opinion should be adopted by all countries, as it would solve many problems. ROFL! I'd comment but I can't stop laughing! Pitu - I'd say we should add this to our 80s cheesefest, but I really, really don't want to see it again. Praz - Thank you! I've enjoyed your site too. I forget how I found it...via Indie Quill, maybe? I Love this movie and have seen the same several times...The music and dancing is great !